Jason Atherton's super-bistro pays homage to both Paris and Manhattan: sit near the back for ultra-discreet seating and wallow in the rich French-style cooking. Please note, Little Social has been relaunched as No. 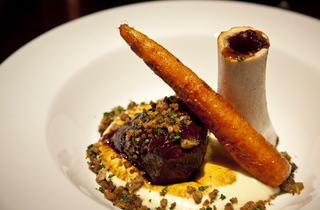 5 Social, a modern British restaurant. Time Out Food editors, April 2019. 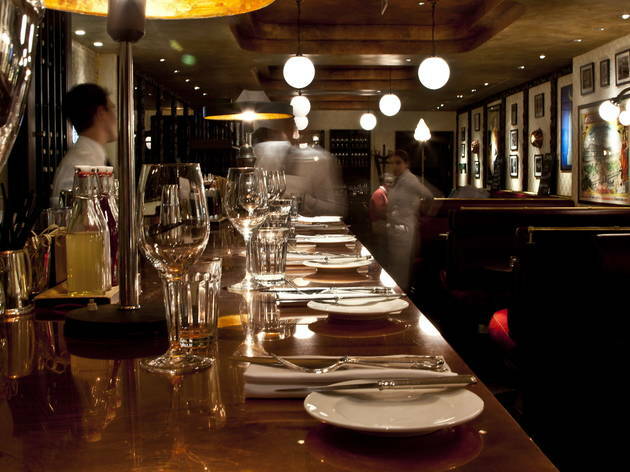 There was a hiatus of several years when French gastronomy seemed to be receding in London. New burger joints, coffee bars and budget Asian diners have been the defining trends of recent years – little wonder, in a time of recession. But proper French cooking is too good to ever go away. This year, the bistro and the brasserie are back, with luminary venues such as Balthazar and Brasserie Chavot now joined by Little Social. We’ve been huge fans of chef Jason Atherton’s cooking for years, from restaurants such as Maze to his current flagship, Pollen Street Social. 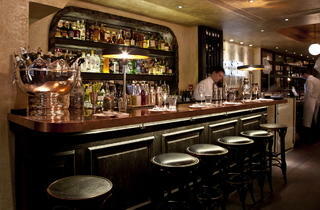 He’s in expansive mode at the moment, with a new place in Soho also about to open. But when the site opposite PSS came up, Atherton scooped it up too. Instead of replicating PSS’s success, he’s created a super-bistro, a luxe homage to Paris, but with a slightly Manhattan accent. There’s a cocktail bar that dominates the entrance: the drinks aren’t cheap but they’re expertly made, and you can eat at the bar if you wish. 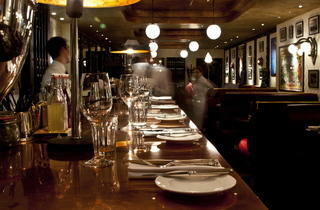 Beyond this are red leather booths; the further you venture, the more discreet the tables become. 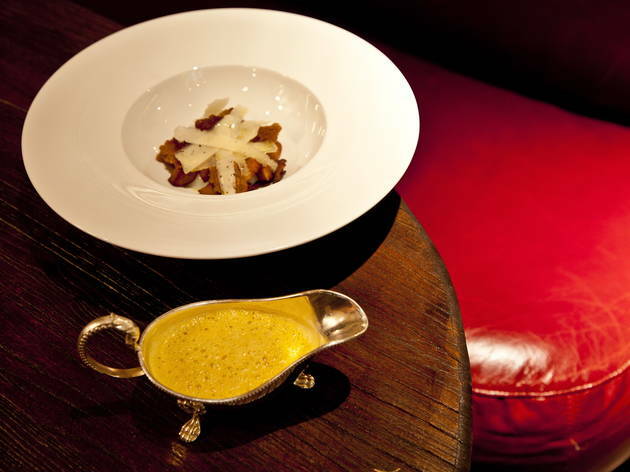 Atherton’s rule appears to be ‘more is more’, so a parmesan and squash soup also contained a poached egg, roasted mushrooms and croûtons; although busy, the dish was a riot of flavour. More single-note but equally excellent was braised ox cheek, served on a dollop of horseradish mash, propped up by a roasted ox bone complete with a tiny spoon for scooping out the marrow. The heavily reduced sauce and generous amount of butter in the mash were resolutely old-school French, and all the better for it. 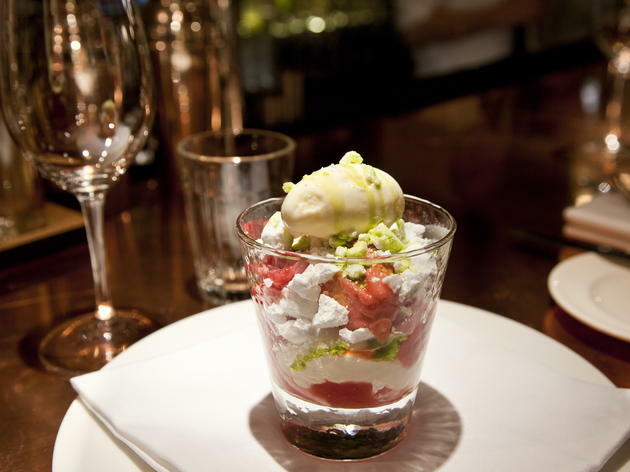 Seasonal ingredients are put to good use, so rhubarb appears twice: in an eton mess served in a glass tumbler with rhubarb sorbet, and again in a jam spooned through a goat’s milk rice pudding. The former was an excellent mix of crunchy meringue, poached fruit and frozen dairy, but the latter was wide of the mark: too runny and drippy, while oddly presented in a copper pan. The result looked like a child’s cookery experiment gone wrong. This however, was the only disappointment in an otherwise exemplary meal. The French staff were charming, the atmosphere intimate, the cooking first-rate, the wines by the glass desirable – and, with set lunches at £25.50 for three courses, a meal here needn’t be rapaciously priced. The bistro is back with a bang. My girlfriend and I popped into Little Social to try out their set menu which was part of the London Restaurant Festival; and I have to admit that I was a little disappointed given the fact that it's part of the Jason Atherton empire. The service is a little stiff here and lacked knowledge when it came to the cocktail menu. I would skip the cocktails here and save the calories for a bottle of wine instead as the cocktails weren’t particularly flavoursome or efflorescent. The flavours in general were not particularly interesting and a little bland in all of the dishes with the exception of the chocolate mousse which was a good balance of lightness and texture - not overly sweet and had great contrast with the praline giving some crunchiness. The pork belly was good and went well with the smooth pomp puree; however it may be quite a small portion for some. The whole mackerel was done well and had a slight crispiness in the skin; though the coleslaw wasn’t particularly memorable besides the fact that the plating was a little strange, it coming in a sauce boat. Overall, I do want to give this place another chance and try the other meatier parts of the menu, which sound more promising. 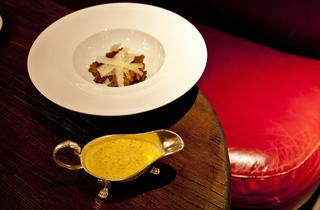 Tip: they offer a set lunch and pre-theatre prix fixe menu available Monday to Saturday, 12pm to 2.30pm and 6pm to 6.45pm. STAY AWAY, Don't understand the difference between vegetarian and pouring beef jus over the top of the meal??? I hate bashing but we have been left with no choice, there is zero concern for customer feedback when we wrote to them directly. My partner is Canadian and I was thrilled at the prospect of an “all Canadian menu”, Nanaimo bars and furnishings of my partner’s birthplace. With this in mind I made a reservation as a surprise for her. Sadly our experience was far from what we expected; please allow me to go into detail of our brief time in LS. We arrived to find a few deer antlers, certainly not Canadian moose, some chequered tablecloths, some dirty heavy throws and a sledge and car licence plates attached to the wall. Air Conditioning set to ice cold. Not exactly homely. The menu which was supposed to be Canadian themed, in fact had very little Canadian options, and if you are a vegetarian as my partner is then no main courses at all to choose from? There were two vegetarian options which are certainly not Canadian (Macaroni Cheese and Spinach and Artichoke Dip) and these were under a “to share” section of the menu. When we expressed our dismay we were encouraged to choose something from a different menu? Isn’t the idea of a “2 day only” Canadian themed restaurant so that you can immerse yourself in the experience being offered? We had at least 4 different waiters serve our table, one was a nice older chap but sadly for us, he had the most appalling breath and it was difficult to engage with him. We never received the requested and agreed second plate of bread from one of the younger waiters. At one point those young chaps started arguing with each other about who was collecting the tip having served the large table in the back room. After our feedback about the menu, the Chef came to our table; we were both stunned to find he was Canadian himself and had drawn up this lacklustre menu. We suggested a vegetarian Poutine (not the sausage laced version available) which he attempted to get a required ingredient from the restaurant across the street from but he could not source this. Nor as it turned out could he serve the much hyped on social media Nanaimo Bar as this was also missing an ingredient? With my partner having been born in Nanaimo this was extremely disheartening. The Chef did say that he hoped to make her a different option from the dull, non-Canadian to share dishes, but alas when the food arrived, it was the Spinach and Artichoke Dip with no Dipping toast. This was left on the counter as the Waiter had forgotten to give it to her; he did however come over and offer some Beef Jus? To a vegetarian? The Salmon that I had ordered was a mixture of cooked to raw and lacked any distinct flavour. The warm potatoes that were supposed to accompany this were served cold. My partner was very disappointed by the whole experience, the barrage of different waiters hovering around the table expecting their tip and asking if everything was ok yet forgetting to deliver the promised food made us both feel very uncomfortable and what was supposed to be a warm feeling of home. I visited Little Social on New Year's Eve (I wanted to enjoy a beautiful meal in the last few hours of 2015, before the diet started on the 1st) and it was a mix of super highs and a few minor lows. The service above all was fantastic, considering it was NYE and I know I wouldn't have been happy giving up my celebrations to serve others out enjoying the night - our waiter was helpful, happy to recommend dishes and very attentive. 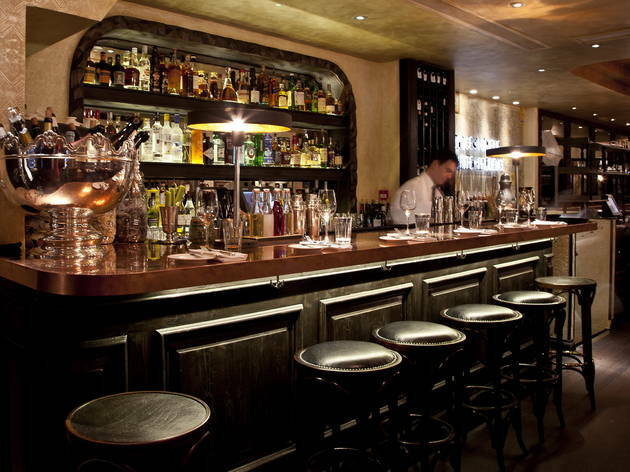 We were sat at the beautiful copper topped bar and the barman was also fantastic, recommending the Pollen Street exclusive white wine (Chenin Blanc) which was incredible - one of the best i've tasted (but sadly can't be bought elsewhere to be enjoyed at home). Our starters - beef tartare & scallops - were a mix of good and bad. While the scallops tasted good, the portion was minuscule! We shared both of the starters and my boyfriend was already half way through by the time i'd finished my first mouthful of the tartare which was gorgeous, though lacked a bit of spice. 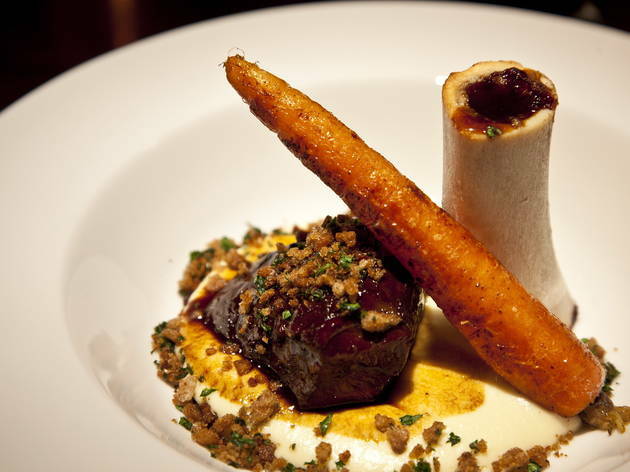 We both enjoyed the same main course - the Ox cheek with bone marrow, horseradish mash and carrots which was sublime - no need for a knife with the ox cheek as it just flaked away with the fork, and the bone marrow was rich, gooey and beautifully presented. For dessert I chose the doughnuts - three huge doughnuts with a sugary glaze filled with oozing warm port jam, a side pot of creme anglais (sadly a little cold in comparison to the warmth of the doughnuts) and a small size of cinnamon sugar. It was quite a large dessert and usually I wouldn't have been able to finish it, but it was truly delicious and the impending diet meant I didn't want to waste the opportunity to enjoy something highly calorific and decadent! My boyfriend on the other hand had the carrot cake (against our waiters better judgement) and described it as "meh". It looked pretty though. Quite pricey but the set lunch menu is a good bet. Good service, cool interior, excellently presented and tasty food. How many pretentious restaurants can a city handle? 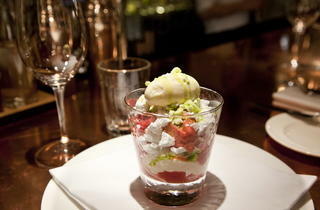 Little Social is yet another over-priced 'trendy' venue serving well presented but mediocre tasting dishes. Lowlights: lamb that was vastly over-powered by anchovies (the anchovies were not mentioned on the menu - not great for someone who doesn't eat fish!) and a 'cheese board' (12.50 a head!) that resembled the left-overs from a dinner party. Also, we were seated beneath the music which was pumping out at loud volume the most bizarre selection of tunes loud enough so that we could barely make conversation or hear the waiting staff. Despite asking for the volume to be reduced on two occasions it remained at an uncomfortably high level for those of us sat beneath the speaker. The saving grace was the service which, apart from their avoidance of our request to reduce the music volume was very good. However I'm sorry to say the service doesn't in itself doesn't justify a repeat visit.